My very first Scrap Your Stash layout and accompanying video is up at twopeasinabucket.com today! Eeeps! Description: You know how the barcode strips at the bottom of patterned papers have patterns on the opposite side? I LOVE those tearaway strips! I hate throwing them away so I like to think of new ways to use them from my stash. Enter today’s technique: paper weaving! The Amy Tangerine Ready Set Go line has bright and bold colors that I associate with my strong-willed toddler named Fox. He has a fox shirt that I took a picture of him in that just had to be scrapped. A paper-woven photo mat is a great spot for these fun photos. I like creating embellishment clusters using all types of products for interest, texture, and dimension, including die cuts, stickers, brads, punching, and spray mist. I tried to use products and images that I associate with Fox or things that he likes - a fox because his name is Fox, a bicycle because that's one of his favorite words, a lightbulb to show how he's bright, a leaf because he loves leaves, a star brad because he loves stars, so on and so forth. After creating this layout I feel like I've made a dent in my tearaway strips stash and saved them from the trash! Journaling says: I'm so glad that foxes are "in" right now! I love when you wear this t-shirt - it's so true! How to: The video shows how to create the layout from start to finish. But here it is written: trim the same color cardstock as the background to 8 x 10" then weave tearaway trips across it; trim the edges shorter. Create embellishment clusters around the photo to draw the eye around the page using brads, stickers, die cuts, a metal disc, wooden veneer shape, and more! Make a title on the bottom right corner. Punch a segment of zigzag border on each edge then drop brown spray mist on top of the punched areas. Challenge: Create a layout with paper weaving using tearaway strips! Making this video was something of a challenge - but I hear that the more you make them the better and easier it gets! It normally takes me about 3 hours to make a layout from start to finish, but I never have a solid 3 hours so it's more like over a period of 8-12 hours or even 3 days. I can't make a 3 hour video. Therefore, I had to plan ahead. Then when I finally filmed myself making the layout, I hadn't pressed the record button!!!!!!!!!!! Rookie mistake. I was sooooo sad and upset and distraught! I had even trimmed all the papers and done the stamping. I had to pull the layout apart and start over and make the best of it. And so, without further gilding the lily and with no more ado, here is my first Scrap Your Stash Video. And yes I know I need a manicure. you rocked your first video!! LOVE the technique. Absolutely love this layout...thank you for sharing! 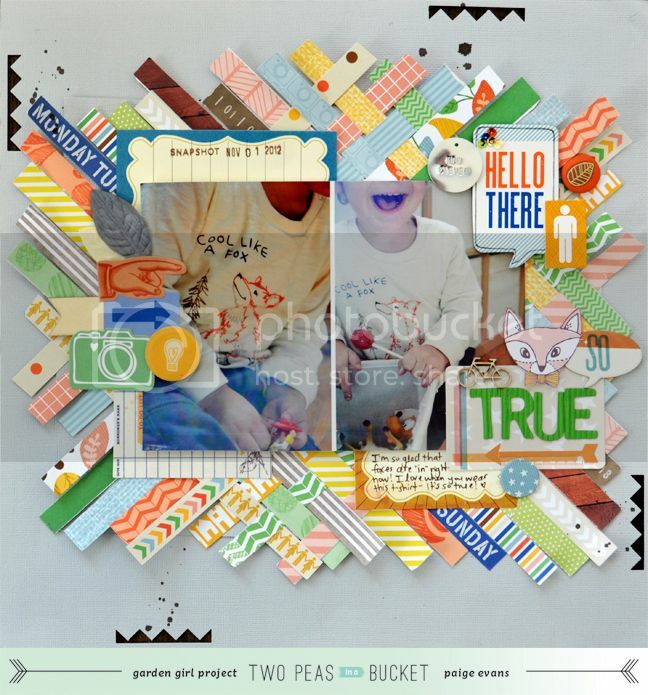 totally LOVE your page and I LOVE those tearaway strips too!!! totally meant to be used!! Way to go Paige, I loved it! You amaze me with your talent!! I loved your first video, great job, I am so inspired to save those barcode scraps and to weave something! You always work such wonders with patterns! Love! that is awesome Paige! I loved watching the video - man your hands move so fast! hehehe To be honest, I just don't have the money or energy to scrapbook anymore, but if I did.. I would just copy your designs! I love to live vicariously through your designs and just be in utter awe of them!... so amazing!! 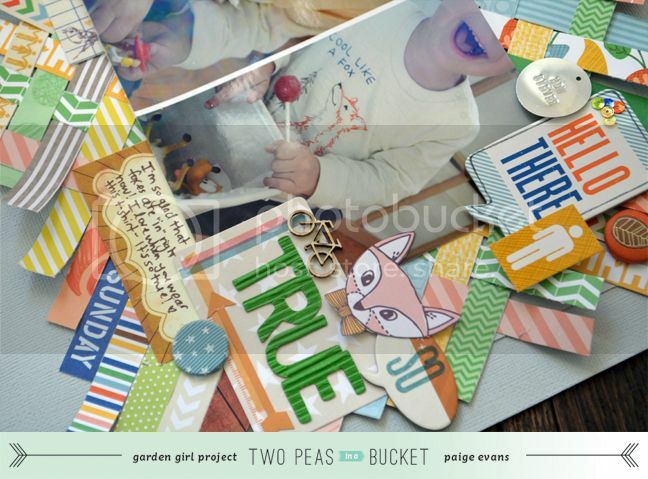 Brilliant idea and design, Paige!I also love paper-weaving and have applied them into my cards and layouts! Thanks for the inspiration and awesome video! Love love love love this!!!! That weaved background is AWESOME!!! WOW!!! And loving those photos...toooooo cute!!!! I loved this video and the layout is awesome! Can't wait to try it! I was just wondering what to do with all of those...perfect idea. Thanks for sharing. I looooved the video, you make everything look so easy. Love your tutorial. I'm gonna try that sometime! Really loving that woven background Paige! Such a fun way to use those strips! Very cool page!! I have drooled over your layouts for years, so I really loved getting to watch you in action!